Buy your Top of the Rock tickets before you go to New York. The Top of the Rock observation deck is on the 70th floor of 30 Rockefeller Plaza. The observation deck offers superb views of New York. 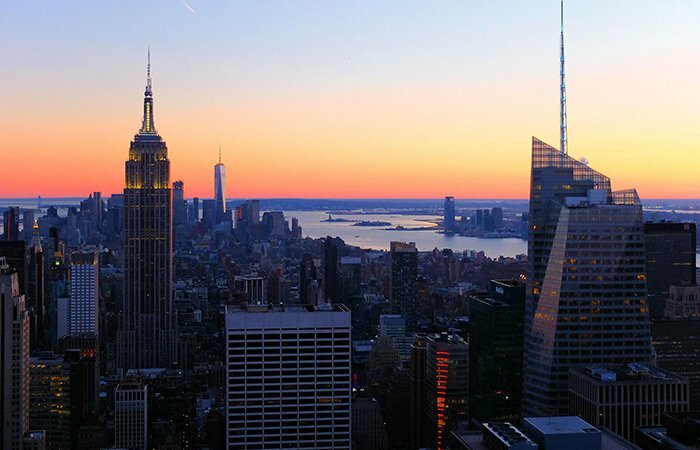 Take the lift to the 70th floor and discover the three viewpoints and enjoy the 360 view from the Top of the Rock. On the one side there is a beautiful view of Central Park and on the other you’ll see the magnificent 103-story Empire State Building. Heading up to the top you can enjoy the mezzanine exposition, a collection of photos and artefacts that tell the fascinating story of the Top of the Rock and Rockefeller Center. You’ll have even higher expectations when you’ve seen the exhibition! The ‘ride’ in the lift is spectacular! The lift’s roof is transparent, so you can see the lift going up in the lift shaft. Click here for the history of Rockefeller Center. Once at the top you have a beautiful view over Manhattan, New Jersey, Brooklyn and Queens! You can see the Chrysler Building, the Brooklyn Bridge and the Hudson River. You can also see Central Park on the north side and the Empire State Building on the south side! You can order tickets easily and affordable online through this website. 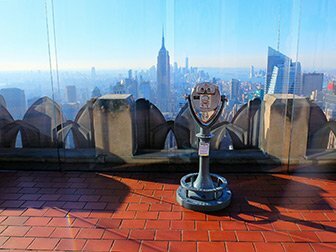 It is also possible to visit the Top of the Rock observation deck with the New York CityPASS or the New York Pass. If you use one of these passes, you’ll be able to use the fast track and skip the queues. If I buy tickets online, can I come whenever I want? Yes. 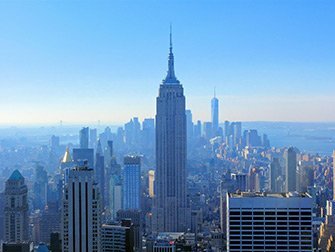 If you buy your Top of the Rock tickets online, or if you use the New York CityPASS or New York Pass you can visit any time. When buying your tickets, enter the date when you think you would like to visit the Top of the Rock. If your plans change and you want to go on a different day, it’s fine. You don’t need to change the ticket, just go to the Top of the Rock and present the voucher. It all depends on how busy the observation deck is of course. During the summer holidays, the Top of the Rock is very busy. I would therefore advise to redeem your voucher/discount pass and reserve a date and time-slot when you’d like to visit. Eric’s Tip: I personally think that the view from the Top of the Rock is nicer than the view from the Empire State Building. You are in the middle of Manhattan and the building is a little lower. 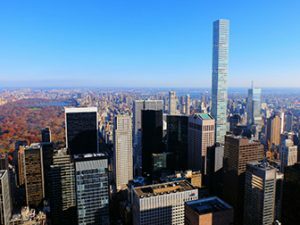 Since 2018 there is a new building that partially blocks the Central Park view, but the view you get is still beautiful. If you have the opportunity to visit both Top of the Rock and the Empire State Building though, then that’s highly recommended. I would advise to visit the Top of the Rock during the day. That way you’ll have the best view of Central Park. If it’s dark the park isn’t clearly visible.